Today around 5pm EST, Chrysler and Fiat CEO Sergio Marchionne watched his custom 2011 Dodge Challenger SRT8 392 roll onto the Barrett Jackson Auto Auction block and when the final gavel sounded – Sergio’s SRT Challenger raised $175,000 for charity. While some of you might be wondering why someone would pay so much for a 2011 Dodge Challenger SRT8 392, we should keep in mind that not only has this specific Challenger been owned and driven by one of the most powerful men in the global auto industry but it is also heavily modified to create a truly one of a kind car just for the global auto boss. 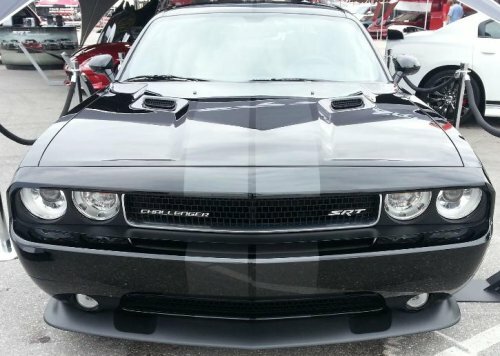 On the outside, Marchionne’s Challenger SRT8 is painted Pitch Black with hand painted Dark Charcoal racing stripes while clear coat protects these stripes for years to come. Next, the Mopar design team added smoked taillights, 392 Hemi fender badges in a two tone gloss and matte black finish and the factory forced 20 inch wheels have been painted matte black to complete the sinister exterior look. Inside, a set of custom black leather seats with embroidered SRT and 392 logos sets off the boss’s interior but this high performance Mopar muscle car also features all of the standard goodies from the 2011 Challenger SRT8 like the exclusive SRT Electronic Vehicle Information Center that offers a timing readout for 0-60 acceleration, 60-0 braking, standing eighth mile time, standing quarter mile and G-force measurements of braking, acceleration and cornering. To improve the performance of Sergio Marchionne’s 2011 Challenger SRT8, the team added a Mopar adjustable coil over suspension kit that improves handling and gives the brawny muscle car a more aggressive stance along with a Mopar high flow exhaust system that adds power and plenty of sound. The 6.4L (392 cubic inch) Hemi V8 remains unchanged other than the Mopar exhaust with 470 horsepower and 470lb-ft of torque (increases from the exhaust system are unspecified) being sent to the rear wheels via a close ratio 6-speed manual transmission. Also, thanks to Chrysler’s fuel saver technology featuring cylinder shut down, Sergio’s Challenger can offer up to 23 miles per gallon on the highway while also rocketing down the quarter mile in the 12 second range. Finally, to sweeten the pot, Mopar threw in a Gen III 426 HEMI V8 crate motor that packs 540 horsepower and 530lb-ft of torque as well as the install kit to put this monster Mopar motor in Sergio’s Challenger. All proceeds of the sale from the Palm Beach Barrett Jackson Auto Auction in Florida go to the United Way of Southeastern Michigan – a charitable group of which Sergio Marchionne serves as the chairman. The United Way helps to provide children from elementary through high school age get the proper education that they need while also providing funding for public programs like soup kitchens and meals on wheels. The winning bidder of the auction for Marchionne’s 2011 Challenger SRT8 paid a whopping $175,000 so all of that money is headed for the United Way. Update: After first publishing this article, the buyer of Sergio Marchionne’s 2011 Dodge Challenger SRT8 sent me an email, offering some information on the destination of Sergio’s car. His name is Miles Nadal and along with being the founder and CEO of MDC Partners Inc in New York, he is an avid car collector. His company MDC Partners is the 8th largest advertising holding company in the world and included in their list of holdings is the Detroit based advertising firm Doner – a company which works closely with the Chrysler Group. Doner was the company responsible for the awesome Fiat 500 Abarth “House Arrest” commercial starring Charlie Sheen. Doner has also handled commercials for the Detroit Zoo. Sergio’s unique Challenger SRT8 will join Mr. Nadal’s collection of classic and modern high performance cars – a collection so large that he has it split up between locations in Toronto and Florida. “I am thrilled to have been the winning bidder and to be able to add Mr. Marchionne's unique car to my Collection,” said Nadal. As an interesting note, one other vehicle that will soon be added to Miles Nadal’s personal collection will be a 2013 SRT Viper GTS Launch Edition so Sergio’s Challenger could spend some time hanging out with one of the limited edition metallic blue and white 2013 Vipers. As a resident of the Metro Detroit area, I would like to congratulate Mr. Nadal for winning such a special car while helping the United Way at the same time. Also, kudos to Mr. Marchionne for handing over his gorgeous custom Mopar muscle car to help raise money for the charity that he helps oversee.